A Chinese government website released satellite images Wednesday of possible plane debris, but searches in the area found no sign of missing Flight MH370. A Chinese government website released images Wednesday of what appeared to be large floating objects in the South China Sea, an area not far from where Malaysia Airlines Flight MH370 was last reported. Vietnam sent planes to the area to search the ocean for any sign of the lost jetliner but was unable to find any debris. "There is nothing. We went there, there is nothing," Malaysia's civil aviation chief Datuk Azharuddin Abdul Rahman said. Vietnamese officials previously said the area had been "searched thoroughly." The Chinese report said the images were taken Sunday morning and appeared to show "three suspected floating objects" of varying sizes, the largest about 79 by 72 feet off the southern tip of Vietnam. It gave coordinates of 105.63 degrees east, 6.7 degrees north. Aircraft repeatedly circled the area but were unable to detect any objects, a Reuters journalist who was aboard one of the planes said. China's Premier Li Keqiang put pressure on Malaysia to enhance coordination, and locate the missing plane as quickly as possible. Of the 239 people on the flight, up to 154 were Chinese. The images were just one possible lead in a confusing and disjointed search for the missing plane that was flying from Kuala Lumpur to Beijing. The plane was last seen on radar at 1:30 a.m. Saturday over waters between Malaysia and Vietnam. Officials said no distress signal was sent before the flight vanished. 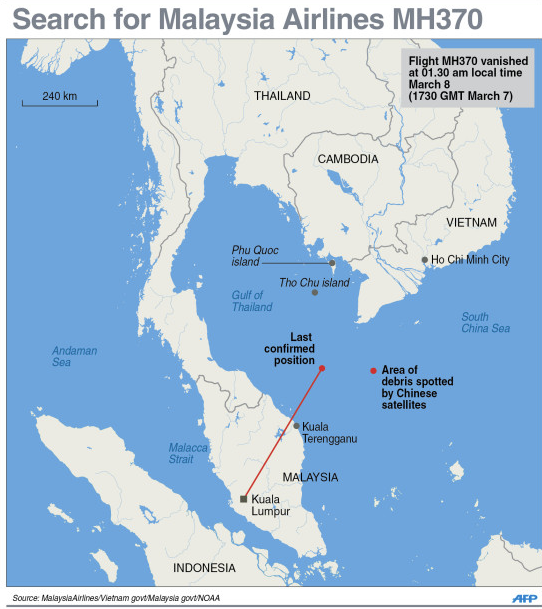 A flight route on a map is seen during a news conference about the search and rescue operation to find the missing Malaysia Airlines flight MH370 near the island of Phuket from Phu Quoc Airport on March 12. Malaysia's air force chief, Rodzali Daud, has said military radar spotted what could have been the plane south of the island of Phuket at 2:15 a.m. The area near the Strait of Malacca is hundreds of miles to the west of the plane's last known location, and there is no proof that the unidentified object was Flight MH370, Rodzali said. The militaries of Indonesia and Thailand said they detected no sign of any unusual aircraft in their airspace. Japan joined the search and India sent New Delhi's coast guard planes to help. The U.S., Singapore, and the Philippines have also been assisting with the search, which now covers 35,800 square miles and involves 12 nations. A U.S. military official said investigators were shown radar records that depict the plane turning to the west and across the Malay peninsula, but it was not clear what was seen. With so little information to go on, no theories have been ruled out, including mechanical failure or terrorism. U.S. counterterrorism officials are also pursuing the possibility that a pilot or someone else on board intentionally turned off the airplane's transponders, according to CNN. Sand artist Sudarshan Pattnaik creates a sculpture depicting the missing Malaysian Airlines aircraft on the beach in Puri, India, Wednesday, March 12, 2014.